Browse this page to get really detailed information on the various options available for rafting in Eswatini (Swaziland). 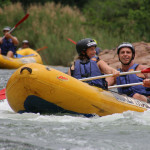 Swazi Trails offer a variety of white-water trips that are constantly tailored to suit the prevailing local river conditions. To start, it’s important to understand that white-water rafting in Swaziland is not a fun fair type activity in a controlled environment. It’s a very REAL adventure in the great and unpredictable outdoors. With over 25 years experience in operating rafting in Eswatini (Swaziland) we have developed various formats to suit changing seasons and ever-changing river conditions. This flexibility allows us to deliver the best available experience for you, no matter what time of year you choose to visit. 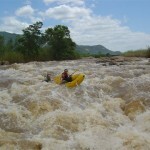 The Great Usutu River, also known as the Usuthu or Lusutfu River locally, is the original home of rafting in Swaziland. It is predominantly a rainfed river and its water levels vary greatly from winter to summer. The summer months of December to March often deliver bank-to-bank brown muddy waters, with fast-moving currents, swirling eddy’s and powerful white-water waves. We have mastered the ability to raft this river during even the most daunting flood conditions. For the rest of the year a steady and reliable flow is guaranteed by the operation of multiple hydroelectric plants, that release water upstream most days of the week. There are periods in late winter, when a combinations of low flows and water conservation efforts on the part the electricity-generating authorities render the river unrunnable on Sundays and Mondays. 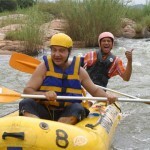 At that time of the year, we are now able to switch rafting in Swaziland to the Komati River. The Komati River, otherwise spelt Nkomati or Nkomazi, is found in one of Swaziland’s biggest river valleys. Water flow on most of the river’s length in Swaziland is totally dictated by water releases from the massive Maguga Dam. This structure with its 110m dam wall was constructed to supply water to downstream agricultural interests in Swaziland and neighbouring South Africa. It is these regular water releases, especially during the drier winter months that make rafting in Swaziland almost a guaranteed certainty. 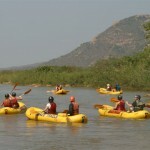 The Komati River is characterised by very clean clear water and a regular and predictable flow that very seldom floods. There are occasions, when after heavy rainfall in the downstream agricultural areas, that the dam is shut off to conserve water, leaving insufficient flow for rafting. Fortunately, heavy rainfall normally means the Great Usutu is again flowing, so we are able to switch back to that stretch. It is this flexibility that makes Swaziland one of the most reliable countries in Africa for planning a rafting adventure. These trips are generally only offered on the Great Usutu River and typically depart in the morning, running side-by-side with full-day trips. The half-day trip on the Great Usutu River includes approximately 7km of river and some of the most popular rapids (Monica Lewinsky, Station Rapid and The Initiator). After a riverbank lunch just above the Holomi Waterfall, the trip returns to Ezulwini. This trip format is available throughout the year, in most years that are not impacted by drought. Recommended for families with younger children. Our general age guideline is 12-65 years of age, but this half-day trip during low-water season is suitable even for younger kids. We will waive the limits on request, when conditions are suitable. As a consequence we often have participants as young as 6 years or as old as 75 years. This trip is best for very large groups of persons (+25), as easy vehicle access allows use of standard midi-buses for transport. We are also able to offer split departures (morning and afternoon), as well as activity rotations where half the groups rafts, whilst half the group does alternative activities, then switching over at lunch-time. Our general capacity on any one departure is 50 persons, but with sufficient warning we can increase capacity to cater for more. For travellers spending limited time in Swaziland on a south-bound itinerary, it is possible to self-drive following the rafting vehicle down to the river. Here an easy vehicle shuttle is available to the take-out point. This then allows participants to continue directly south towards Mkhaya Game Reserve, Hluhluwe or even Lake St Lucia in the afternoon, saving at least two hours of back-tracking time. Non-rafting group members can be suitably entertained on a guided cultural walk, or a rural MTB trail, meeting up at our waterfall lunch-spot. Due to logistics, it is not currently possible to offer half-day trips on the Komati River, so when conditions dictate that we use of the Komati as our preferred section, then a full day rafting combo adventure is your only option for rafting in Swaziland, see details below. This full-day trip is also typically offered on the Great Usutu River and departs in the morning from the Swazi Trails offices in Ezulwini, with a vehicle transfer down to the river. There is approximately 19-21km of river depending on which take-out is used. The route includes rapids both before and after lunch. A picnic lunch is offered at the Holomi Falls. There some relaxed and scenic stretches between rapids, allowing time to recover and to appreciate that rafting in Swaziland is as much about the excitement, as it is about being out there under an ever-changing arc of sky, drifting, chatting and enjoying the ceaseless flow of the river. This format is available during the summer and autumn seasons only, generally December to March, sometimes as early as November or as late as May. Arrival back at Swazi Trails 16h30-18h30 depending on conditions, group size and ability. Our daily capacity on a full-day trip departure is 50 persons. Suitable for ages 12 to 65 years. This trip is mostly run in high water season, so not generally advisable for those younger than 12 years, due to both level of difficulty and distance paddled. Non-rafting group members can be suitably entertained on a guided cultural walk, or a rural MTB trail, meeting up at our waterfall lunch-spot half-way through the day. The full-day Rafting Combo trip on the Great Usutu includes the options of abseiling and tubing. This is generally an autumn and winter season format, typically offered from May to September. “Combo” stands for combination and after the morning’s half day rafting section, participants are offered the choice of either abseiling or tubing in the afternoon. Abseiling is rigged on the cliff just below the Holomi Waterfall, whilst for those not keen of heights the option of returning upstream to re-run some of the main rapids on white-water tubes is an alternative option. There is typically 7km of river for rafting, about 1km for tubing and the abseil involves an exposed 15m pitch. This combo format can be useful for splitting large groups, with half starting with rafting then switching to abseiling or tubing in the afternoon, and the either half doing activities in reverse order. Members of a family or group who are not keen on rafting in Swaziland can be entertained on a guided cultural walk, or a rural MTB trail. We arrange to meet up at our waterfall lunch-spot, where the non-rafters can participate or observe afternoon activities at leisure. Our general age guideline is 12-65 years of age, but this trip during low-water season is suitable even for younger kids. We will waive the limits on request, when conditions are suitable. As a consequence we often have participants as young as 6 years or as old as 75 years. This full-day Rafting Combo trip on the Komati River is the newest of the options from Swazi Trails for rafting in Swaziland. This new format was pioneered in October 2015. “Combo” stands for combination, and certainly this full-day excursion has been described by participants as much more than just a rafting trip. If you want to experience Swaziland in one epic day, then this trip should do it for you. It includes arguably one of the most scenic drives through the mountainous north of Swaziland, access to an exciting stretch of river that forges its way through a remote area and a visit to one of Swaziland’s most famous, yet seldom visited geological features – The Gap. Its also a cultural experience, which ranges from time spent with your local Swazi guides, to seeing Swazis fishing, hunting or farming on the riverbanks. In addition to paddling, participants have the option of abseiling or cliff-jumping after the lunch break, and most of the afternoon activity is focused around this. This particular trip is generally a winter season format, typically offered from May to November, but also during unnaturally dry summer seasons. The morning’s half day rafting section ends at a moonscape of rock which is characterised by a waterfall that captures the entire flow of the river. The water disappears 10-12m down the fall and then travels underground for 50m before emerging in a narrow gorge. Lunch is enjoyed here whilst surveying this unique spectacle. Participants are then offered the option of either abseiling into the gorge (a 16m descent), or cliff-jumping (14m), whilst those that prefer not to dabble in aerial activities can scramble down the same route used by the guides to get the rafts back into the water. Thereafter comes the most difficult stretch of rapids on the river, approximately 150m in length and graded 4+ in terms of difficulty. Known as Tragedy Rapid, it is not to be trifled with. Here the guides will either run the group through one boat at a time, or request a portage, when pre-assessed individual or group competencies dictate caution. A short way downstream the trip ends at one of the few vehicle access points in this river valley. Sundowner drinks are then enjoyed, whilst the rafts are packed and finally a stunningly beautiful drive (in fact it could be called a tour) is undertaken through rural landscapes of Swaziland back to Maguga, Mbabane and finally the Ezulwini Valley. Return transfer 2 hours via Maguga and Mbabane. Arrival back at Swazi Trails 16h30-18h30 depending on group size. The abseil option at the The Gap is suitable for absolute beginners and has an ideal launch position. The cliff-jump at The Gap is strictly for experienced cliff-jumpers, who have jumped 10m+ in the past. With a height of 14m, a narrow landing area and solid glassy water, this is not recommended for anyone who is not confident of a 100% correct landing position. Those adrenaline junkies with sufficient skill who do attempt it, will no doubt rate this as a trip highlight… it’s a big WOW! Maximum numbers for this trip are 32 pax, due to transport constraints (valley access requires off-road vehicles) although with sufficiently early pre-booking a higher capacity could be accommodated – up to 50 persons. Our age limits for this particular trip are 12 to 65 years. Hippo are known to exist on the Komati river in low concentrations, and recently (as of 2018) have been seen regularly on our trips. To date our contact with hippo on this river has been without incident. There may be a need to portage around the hippo on the bank, where space does not allow us to safely pass them in the river. 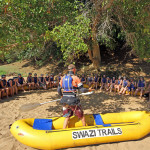 For more information on rafting in Swaziland check our Rafting FAQ page for answers to frequently asked questions. I would like to book a rafting trip on the 13th of October (2p). Is a full day already possible or will the river not be “wild” enough?